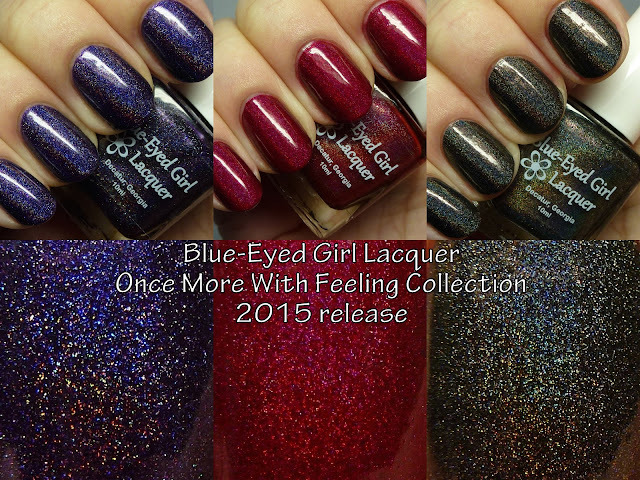 Blue-Eyed Girl Lacquer has re-released the Once More With Feeling Collection for 2015! This collection is close to my heart, even though I never watched Buffy, as it was the first one I ever bought from BEG back in 2013, which got me hooked on the brand. Two of the colors have been revamped in terms of shade and there is a new full-collection bonus polish. Also re-issued polishes have been re-formulated to be more opaque. Let's check it out after the break! 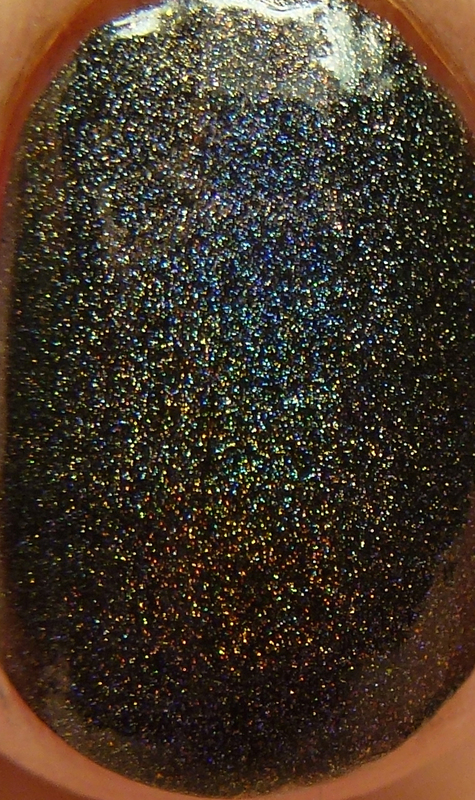 5X5 (representing Faith) is the limited edition bonus polish that you get with full collection purchase. I mean, seriously, you should buy the full collection anyway. This is just added incentive! 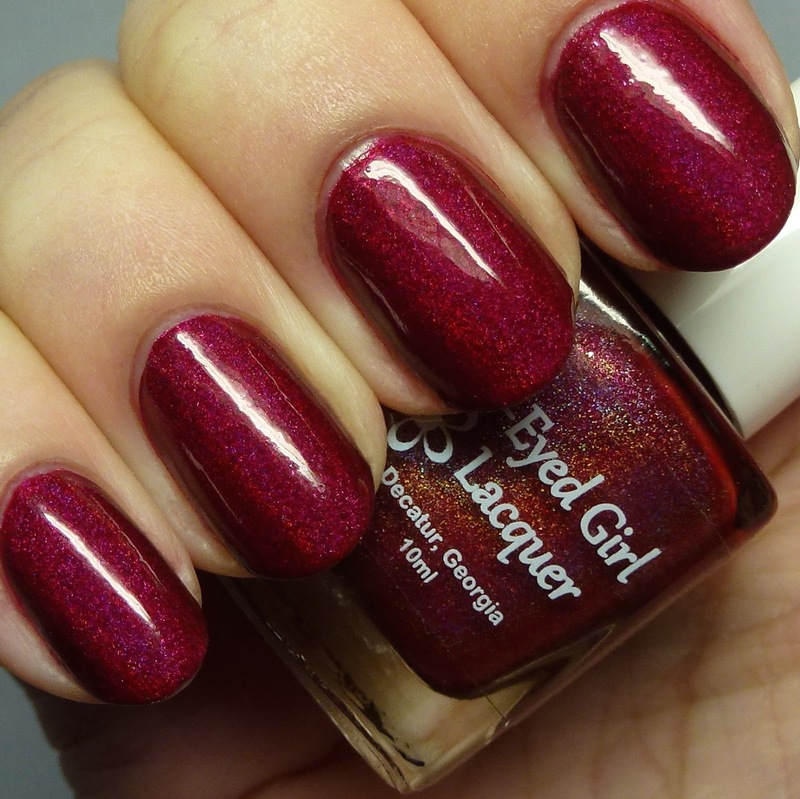 The full collection in 15 ml bottles (nine polishes total, including 5X5) is $96 and is worth every penny! It is rare for a holo with microflakes to be truly linear, and this one is the exception. This polish has pink, turquoise, and purple glass flecks in a deep violet base. 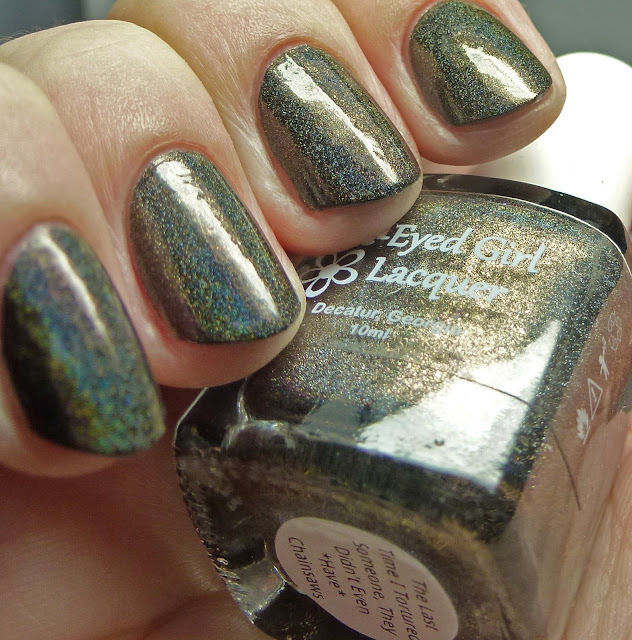 It was two thin coats for me with a perfect formula. So much love! 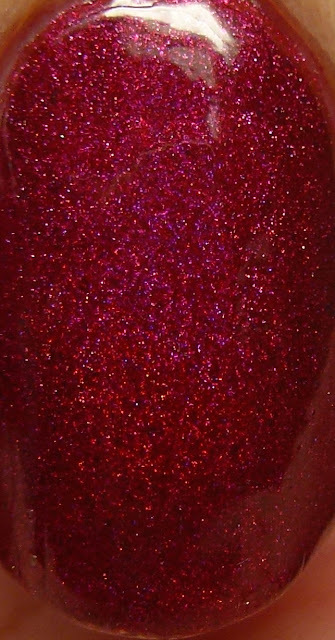 I Fought For My Soul is a glowy, blood red holo with gunmetal microflakes. 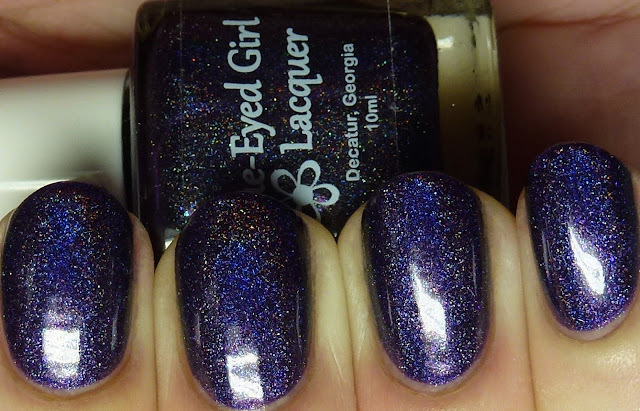 I wore this with two thin coats, but it could be a one-coater for most people. 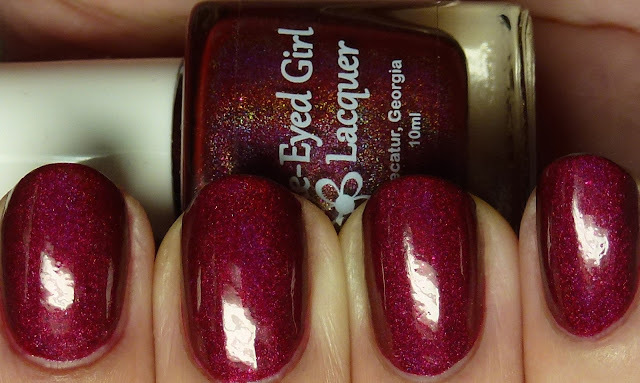 I adore this kind of shade - it is so hard to get a great, dark red holo and this one is a gem! 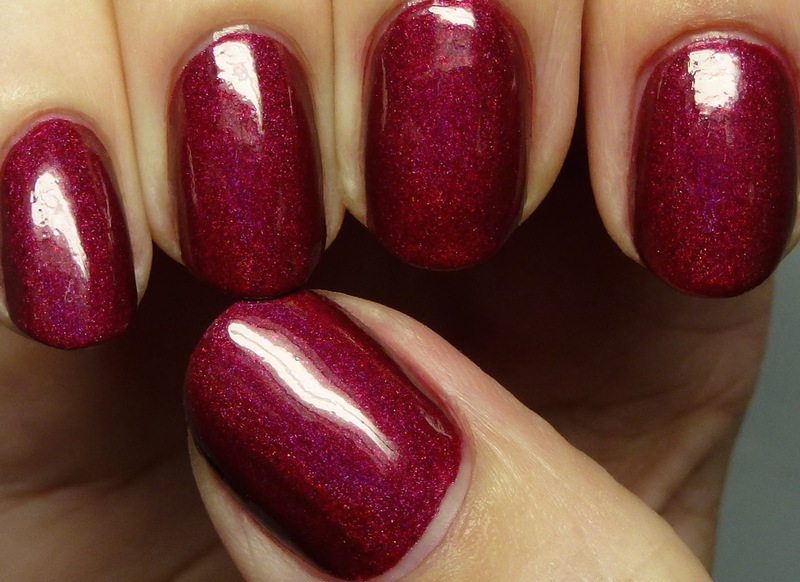 Since it is so pigmented, I recommend being careful while painting as it will stain any dead skin, though there is no staining of the nail bed or live skin, even upon removal. This is a replacement for the original Spike polish, so if you bought the original collection you need to pick this up! It costs $12 for full size, $6 for mini. The Last Time I Tortured Someone, They Didn't Even *Have* Chainsaws represents Angelus. 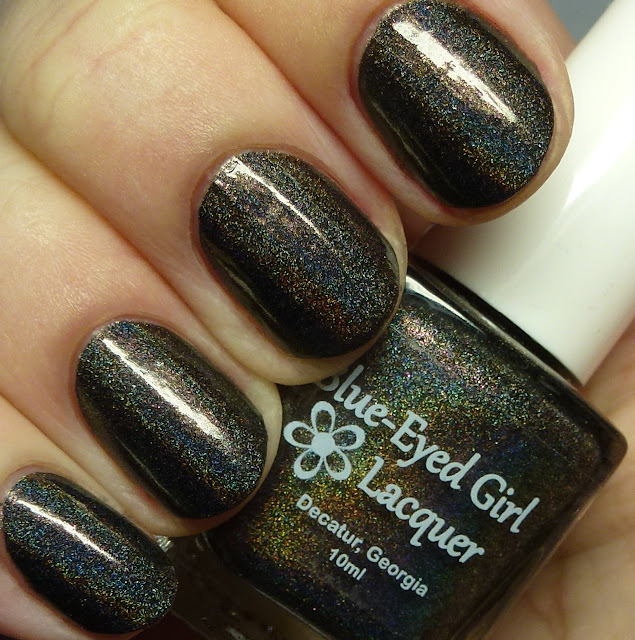 This is another new shade that you will need if you bought the collection originally. It has linear holo and duochrome pink-to-green flakes and shimmer in a black base. 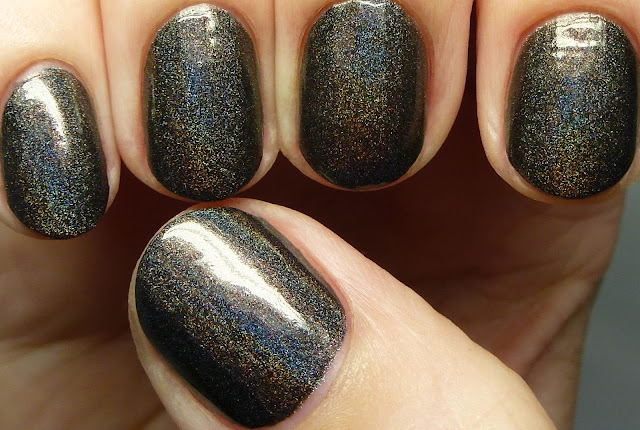 Due to the shimmer, it takes on a really deep brown look - so complex and gorgeous. 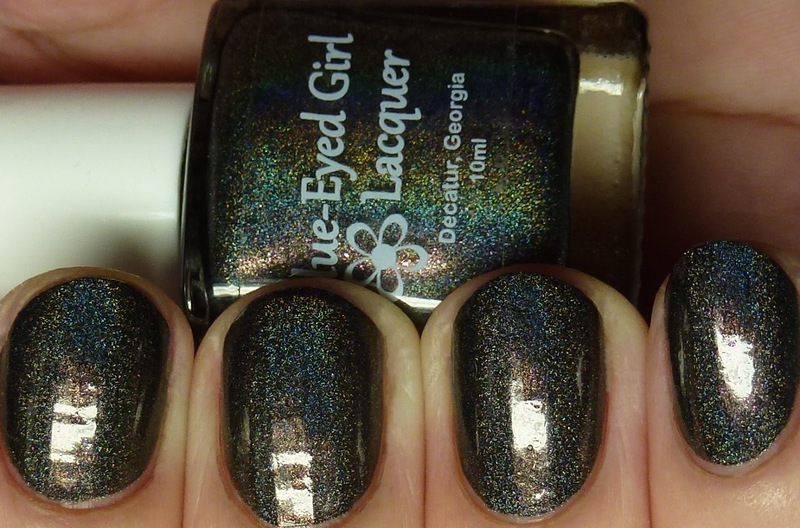 This is also really pigmented - I did two thin coats but one is enough. This is also priced at $12 and $6. Please note that 5x5 will ONLY be available as a free gift with purchase of the full set and will be available in both full and mini sizes while supplies last. HOWEVER, I do recognize that some people are filling out their existing collection or already have a full collection from before. For those people, as long as you provide proof of your previous orders, I will offer 5x5 as a freebie with a current order if I still have some in stock. Anyone who does not plan to order during this restock OR received Anya (Floppy, Hoppy, Bunnies!) as a freebie during the previous restock will not be eligible for the free gift. However, email me with your proof of purchase, and I will send you an invoice of $12 plus shipping so you can round out your collection (again, if I have it still in stock). 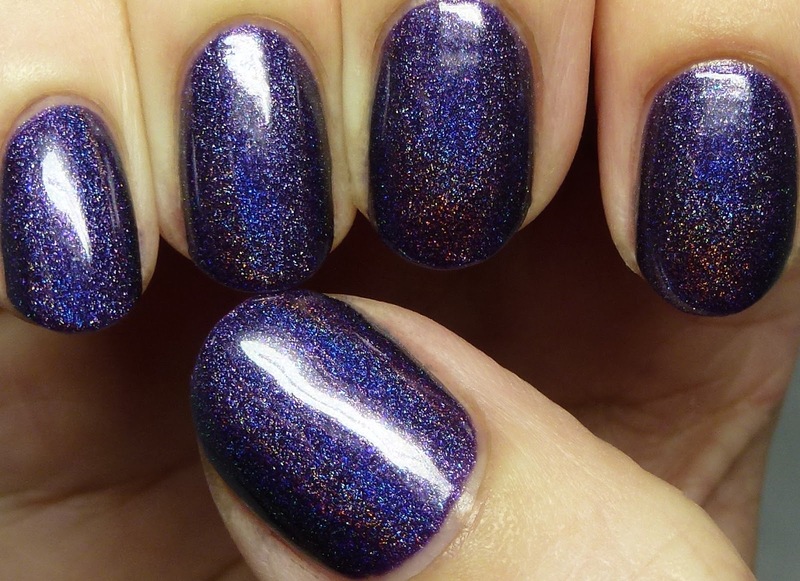 Proof can consist of a photo of your OMWF collection, a copy of your receipt for OMWF collection polishes, or a mixture of both. Since Scoobies won’t be available for this restock, it won’t count against you if you don’t have it in your collection. For those who are planning to purchase from this restock, please specify in the “Notes” section upon checkout that you will be sending me an email with your info. 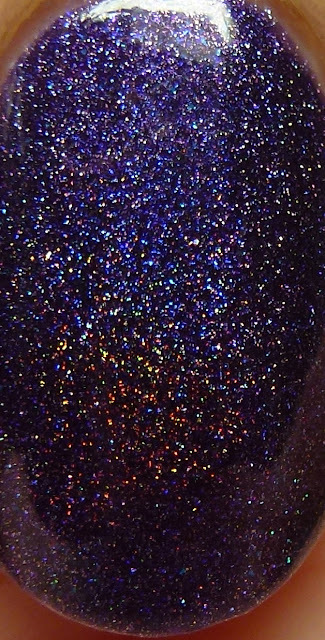 I will send it along with your order. The email address you should send your info is: wishesofablueeyedgirl@gmail.com.